Eating out can be fun, but it can also be expensive. That is why a lot more people tend to spend some time in the kitchen creating their own delicious meals. Sure, it takes a little work, but it does help one relax and save money while at it. Of course, there is the anticipation for what comes after cooking – eating! One trend that seems to be going strong is for people to patronize cooking- or food-related TV shows and web sites. Movies are not exempt, either! The popularity of celebrity chefs has largely contributed to this, and they have not hesitated to take advantage of this. There are also a considerable number of web sites dedicating themselves to providing recipes to the average person who makes meals in his or her own kitchen. 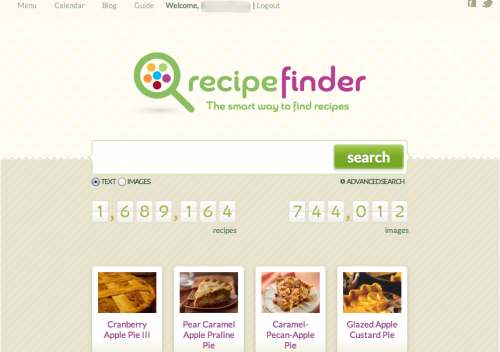 Speaking of recipe portals, there is a newcomer in the arena: Recipe Finder. This new site is a search engine that has been designed to provide users with the best recipes that can be found online. With more than a million recipes in the collection, Recipe Finder offers users more than other recipe sites. Recipe Finder is about more than discovering recipes. It gives you some help in the organizational front via two features: the menu feature and the calendar feature. The menu feature allows you to create a fully customizable menu which can include the appetizer, main courses, and desserts. The calendar feature gives you the possibility of planning entire meals in advance. Recipe Finder is a breeze to use, not requiring technical knowledge from you – the user. All that you need to do is to key in the recipe name or an ingredient. There are also options which allow you to conduct a narrower search, which will give you more relevant results. For example, you can use the feature which allows you to indicate ingredients which you want to be included in or excluded from the recipe. Furthermore, you can indicate parameters such as calorie count, cook time, and the number of servings. With these features, you are assured of the best results. For many people online, sharing is very important. Social networking is the key for them. Recipe Finder addresses this preference by providing sharing options using some of the most popular platforms. And if you are the kind who still prefers the feel of paper in your hands, then simply click on the print icon to create your hard copy! What’s left for you to do is to cook! You never know, they might just make a movie out of your life if you turn out to be one heck of a cook.